The Parade de Cirque was a taster designed to whet the appetite of passers by and persuade them to part with their entrance fee in order to see the full performance of the circus within (in this case the peripatetic Cirque Corvi). Our attention is caught initially by the figure of a mysterious trombonist who stands at the centre of the stage, elevated on a plinth which may also project forward into the small crowd of onlookers. His stance is at once passive (perhaps one might detect a note of effeminacy) but also faintly sinister. To a considerable extent this effect stems from the musician’s choice of headgear – a very peculiar conical hat which could be an indication of secondary duties as a magician. To the left of this singular musician three more members of the ensemble accompany him (with the instrument and left arm of a further player just visible on the extreme left), each standing at an exact distance from each other, each dressed the same – were it not for a difference in height they could be taken for clones. To the right of the central figure, in front of the cash kiosk the ringmaster struts, his cane held firmly under his arm in military style. The heads of the crowd are either seen directly from behind, chiming with the frontal orientation of the band, or in profile like the ringmaster. This rigorous arrangement reminds one of an Assyrian relief or an pharaonic Egyptian painting flat, alien, pregnant with unknowable mysteries. This picture is very different from Seurat’s earlier sun-drenched compositions such as Bathers at Asnières and An Sunday on la Grande Jatte. Whereas these two masterpieces depict the escape of city dwellers to the cooling airs of the river Seine’s suburban reaches during a summer weekend, Circus Sideshow is unremittingly urban and wintry, the scene lit by the glow of gas lighting. 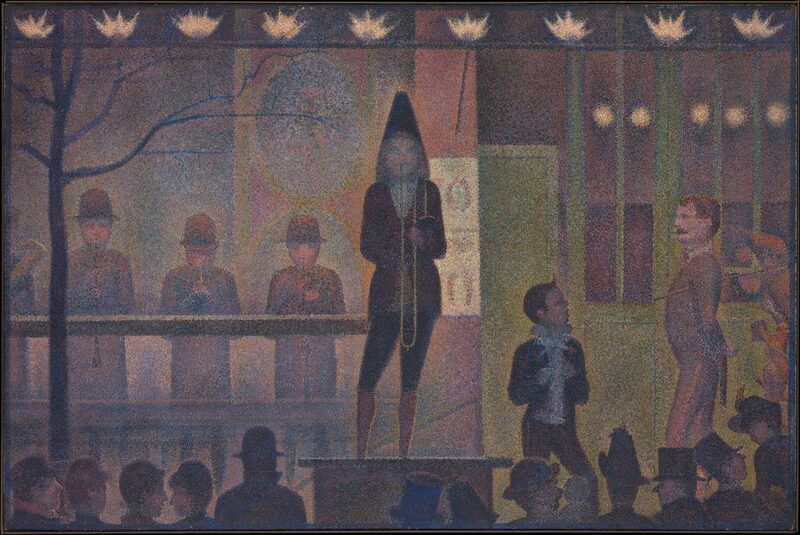 Although a link remains with these earlier pictures in that Seurat is illustrating the pastimes of ordinary people, this piece also represents a further development in his researches into optics and it is the first time he had used the pointillist technique to represent the effects of artificial light. The dominant blue–orange–yellow spectrum of dots fuse to give a range of greens, purples and darker colours. (It seems that the impetus for this may have come from the publication by the Symbolist poet Stéphane Mallarmé of a paper by Whistler on the problems associated with the depiction of artificial light).